UNDERWATER: Happy woman diving in the turquoise sea is approached by a stingray. CLOSE UP: Cheerful woman In bikini enjoys diving in the beautiful turquoise sea. UNDERWATER: Smiling man takes a selfie with a stingray while diving in ocean. 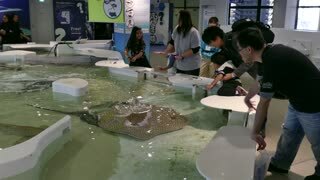 UNDERWATER: Young woman diving in the glassy Pacific feeds a hungry stingray. UNDERWATER: Sharks and stingrays muddle up the turquoise ocean with white sand. UNDERWATER: Young woman snorkels in the turquoise sea among friendly sharks.